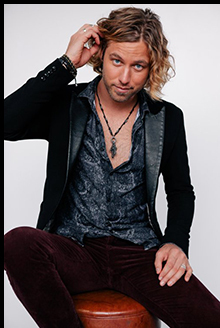 Blues singer, songwriter, guitarist Casey James took time from touring to speak with Luxury Experience about his new fabulous release, Strip It Down, as well as about his life. From learning to play guitar at age 13, to being a finalist on American Idol, to his musical journey through life, Casey James is clearly an inspired talent who looks ahead and builds on each experience; he is also an extremely nice person. Casey, thanks for taking time to speak with Luxury Experience. As a way of an introduction, you grew up in Texas, started playing	guitar at age 13, and from there you kept building upon the music, becoming a	finalist on American Idol on Season 9, and ultimately launching your solo	career. What can you tell me about your musical journey to get you there? What	inspired you to start playing guitar? When I say I picked up the guitar at 13, that actually happened. My	father is a guitar player and he was trying to show my older brother, a bass	player, how to play a chord or a lick, and he wasn't getting it. He kept showing	him how to do it, yet my brother wasn't grasping it. I was sitting around	near them playing with a game, and I asked my father to show me how to do it. My dad said that what he was trying to teach my brother was really hard and	that my brother had been playing for several years, but he could show me how	to play something else. He taught me how to play a chord, and when I played the	chord it "rang" and it sounded really nice. My dad said Casey, that's good,	and that was the beginning of a journey. When I started playing at 13, I think a lot of guys I knew wanted to	play guitar to get girls. I literally picked up the guitar and thought I'll	do this and make the guitar do something. It brought such a feeling of joy. I	loved playing the guitar. I liked the sound, and how I could make it do what	I wanted to do. Create, and soothe the soul. No, I went and bought a chord book, and learned to switch from one	chord to another. I learned that going from a G to an E minor was beautiful,	and as I was learning, I was giving myself guitar lessons. When I learned to	play it was before the Internet, so I learned from a book. I would love to	take lessons though. If I see a guitar player doing something interesting,	I'll go up to him and ask him how he did that, and usually they will show me. I'm like a sponge, I love learning more. I listened to traditional country like Merle Haggard, heavy metal,	big bands, hip hop, R & B, folk, funk, gypsy jazz, Latin, and I always	loved the blues. I like all types of music and agree with BB King who said	there are two kinds of music: good and bad. I love your new release, Strip	It Down, with its tri-fold design, booklet with liner notes, lyrics, and	musician information, that really connects the listener to the music. I also love that you wrote 13 of the 14 songs on the album. Thanks for noticing. I'm really very proud of this release. I put a	lot of time to put together the booklet, but I felt the extra time and effort	was worth it. As for writing, I'm from Texas originally and I had no idea that not	everyone wrote their own music, as 99% of Texans write their own music. It	wasn't until I moved to Nashville that I found out not everyone does that. I	like to convey my own thoughts and feelings - for me, that's the best way. The inspiration for the project was a healing thing for me. I went	through not hard times, but wonderful blessings, but now I had the	opportunity to do what I wanted to do; to be 100% honest in what I wanted to	do and hear. I write songs for myself, which is the way that I'll make all my	records from now on. I've got a lot to say, and the overall theme (of the album) is to be	happy where you are, to keep your hopes and dreams, but remember that the	journey is more important than the destination, and think that perhaps others	can relate to the music; to be at peace, be happy, and self-empowered. American Idol opened a lot	of doors for me, and I've learned that I would not change anything. I toured	the world, did a USO tour, and traveled to the Middle East, and Africa. What's next for Casey James? Personally, on November 30, 2017 our baby boy makes his arrival. My	wife and I have a little girl, Alexandria, who will be in 2 years old in	January 2018, so I blocked some time off from touring. For Christmas we will	go to LA to be with my wife's family, and we will spend New Year's in Georgia	with my family. Professionally, I'll be playing on the Delbert McClinton	& Friends Sandy Beaches Cruise from January 6 - 13, 2018, the Blues Foundation asked me to be a	judge for the Blues Foundation - International Blues	Challenge, January 16 - 20, 2018, and then I go back to touring. Will your tour dates include Europe? No, however I really want to do a European tour, and there may be an	Australian tour. When not writing new music or playing gigs, how do you like to spend	your time? My wife and I like to have folks over and cook; we love to host	friends. We live in Nashville, and like to travel, shoot pool, I like gaming	and competitions, play golf, hike, and although not super outdoorsy, I like	offshore fishing. I'm a jack-of-all-trades in life - musically and	personally, and my wife likes it that I can fix things and fix cars. Casey, thank you for taking time to speak with Luxury Experience. I	wish you much continued success. Keep enjoying the music! Read Luxury Experience's review of Strip It Down in the Music Scene section. ©December 2017. Luxury Experience. www.LuxuryExperience.com. All rights reserved.